Two key measures for developing the game are junior development and the quality of the top tier, as shown at tournaments such as the International Cup. With the correct structures in place, getting the junior numbers should flow into senior success. New Zealand and PNG have already enjoyed top 3 status at the inaugural Cup, whereas the Africans finished without a win. Since then junior development has increased, but this isn't likely to be reflected at senior level yet, but should by around 2010. South Africa has ambitious short term goals for junior participation levels. They currently have around 1000 kids involved in footy programs, and the target set for the Development Officer is 3000 by year's end, and 5000 by the end of 2006. 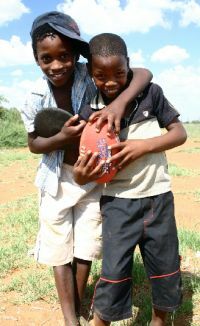 A recent coaching and umpiring clinic in Mafikeng had 35 people attend from 13 communities - these are the people that will hopefully run local junior football leagues. As many as 7 of the regions in North West Province should have programs in 2005. The AFL has made a strong commitment to footy in the nation, in May announcing an increase in funding to 500,000 Rand (about AU$100,000) per year for three years. In the press conference at the University of Johannesburg (RAU) Astroturf Hockey Club House, Brian Dixon, Chairperson of AFL South Africa, announced the appointment of Jean Verster as the new Executive Officer of AFL South Africa. He takes over from Steve Harrison who will remain on as Head Coach until his contract ends on September 12th. Mr Dixon also announced a new Head Coach, Mtutuzeli Hlomela, who will commence work in September. Hlomela, affectionately known as Tutu, is a silky skilled player who was named in the World Team after the 2002 International Cup. His introduction to the game came many years ago when he was awarded a scholarship to play at the Sturt Football Club in the major South Australian league. There Tutu learnt the game with the Double Blues' under 19 side. Now very much a senior player, he coaches a club based in Soweto. Also announced was a new Development Officer July Machethe, and a new Administrative Assistant Phindile Khambule. Mr Dixon said it was a testament to Steve Harrison that he is being replaced by three full time people and one part time person. The AFL funding is in addition to existing funding from Tattersalls, the National Lotto Distribution Trust Fund, the North West Provincial Government, the North West Academy of Sport and other donors. Mr Verster said he will be concentrating on the development of primary and secondary school children. Potchefstroom, in North West Province, will be a very strong base for development, as well as areas in the provinces of Gauteng (which includes Johannesburg and Pretoria - recently renamed Tshwane) and Western Cape (including Cape Town). During the 2005 International Cup it is planned that all four new appointments will stay in Melbourne for briefings with the AFL and National league teams. The St Kilda Football Club, which visited Potchefstroom last November, will host South Africa.